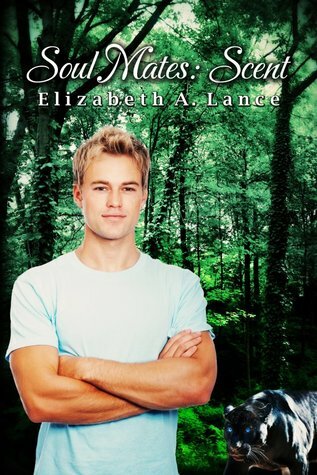 Full Moon Bites: Excerpt of Soul Mates: Scents by Elizabeth A. Lance! 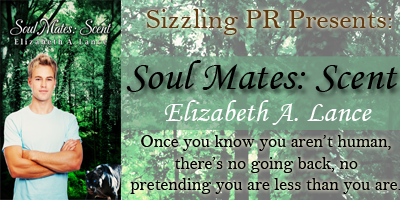 Excerpt of Soul Mates: Scents by Elizabeth A. Lance! It wasn’t the first time I’d seen her. The girl with the shiny black hair and distinctive blue eyes that seemed to see right down to my very soul. No, the first time I’d seen her was as she stood across the street from my house staring at me as I pulled my ’69 classic Vette out of the garage. It had been the cause of my first real fight with Jenny. Jenny was my girlfriend. I say was because we broke up that day. She didn’t believe me when I said I didn’t know the girl. The next time I saw her was a week later, just standing outside of my school, watching. I only saw her for a second because when I blinked she was gone. For a while I thought I might have been imagining her. Jenny and I tried working things out, we were tentatively dating again, when the girl appeared again. This time though, I knew I wasn’t imagining things when she walked into my homeroom class, her gorgeous black hair hanging loosely down her back, grazing the pockets of her designer jeans. Okay, I didn’t know at the time they were designer, I just figured with a body like hers it would be a sin to put it in anything else. “Shut the hell up Steve,” I growled under my breath as I glanced back at her, but she was back to listening to Mr. Jackson. I’d forgotten Jenny in those fifteen magical seconds. Steve was right. Jenny wasn’t going to be happy to see the girl we’d fought about weeks ago. But there was something about her that drew me to her. It was cosmic, or fate or something and I knew she felt it too as she walked down the aisle toward me. Her name suited her, she moved in a feline kind of way. Her hips swayed just a bit as she got closer to me and I started breathing hard as I realized she was headed straight toward me. I didn’t have the foggiest idea of what to say, me, president of the student council, captain of the debate team and star athlete, was for once at a loss for words. “Bonjour,” she said as she took the seat directly behind me, her eyes never leaving my face. Her soft French accent sent chills down my back. “Anna,” I breathed her name like a prayer. I felt something inside me shift as I gazed at her and I knew I had just met someone that was going to change my life. I heard nothing for the remainder of homeroom. It was all I could do to stay in my seat and face forward when all I really wanted to do was turn around and take in every ounce of her. “Uh, sure. What, er… what’s your next class?” I asked still feeling like that brain dead geek I mentioned. “Oui, Anglaise.” She smiled and my heart melted. “Magnifique!” she replied, her blue eyes twinkling brightly. I held my breath as she slipped her arm through mine and we stepped out of homeroom together. I scanned the hall and faltered for a moment. A feeling of guilt washed over me. Jenny stood across the hall, waiting on me to walk her to class. She looked… pissed. When the girl of his dreams walks into his homeroom class one October morning, Max Fergus, a seventeen year old quarterback and star student, has his world turned upside down; everything he has ever thought about himself and his life is changed in that instant and nothing will ever be the same again, because once you know you aren’t human, there’s no going back, no pretending you are less than you are. Anna Lissa Felidae, a pure blooded shifter has been searching for her soul mate, the one guy that was meant for her, and just when she is sure she is about to run out of time, Diana, goddess of the hunt, appears to her and sends her in the right direction. With another shifter on her trail, one who is determined to have her no matter what the cost, Anna has just three short weeks to convince Max he is a pure blooded shifter, among other things, and teach him to fight so they can be together. With the help of a few Fae friends, a motley crew of shifters and Max’s best friend Tony, they are sure to win.